General information about travelling to Scotland can found in this article. For things more directly linked to photography, I suggest you read keeping the books 3, a review of two weeks of landscape photography, Summer 2006. There one can find everything about targets, gear, percentages of keepers and binners of the 2006 holidays. As a reaction to last year's story ('you must have a good marriage...'), someone wrote me that he enjoyed the reading and found it 'amusing, informative and strangely comforting'. Alas, he didn't explain what was so comforting, but I suppose that sharing my illusions, stupid actions and bad luck helps other people to deal with the small problems of life! We have been in Scotland many times before and come back time and again. 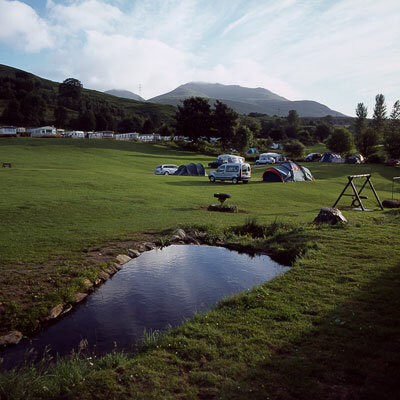 'The people must have been nice to you', a Scottish woman on a campsite said, 'that you come here so often!'. Indeed, we love the people as much as the scenery, the history and its nature. Nevertheless, after last year's wet and wild journey to Lewis, Harris and Skye we have been seriously looking to visit another country this year. The idea of keeping an 18 month old todler inside the tent simply because he can't swim yet was a bit too much. 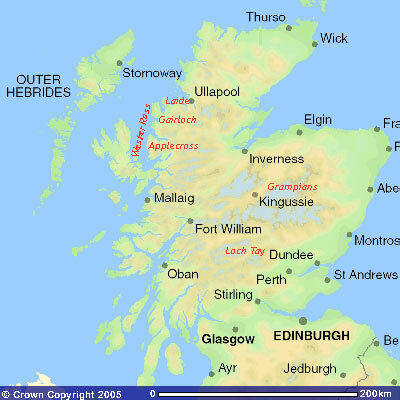 But as the Summer approached and we looked in guides for France (Brittany, the Alpes) my wife said 'what the heck, I just want to go to Scotland again!'. Now, that is what they call love! Image reproduced with kind permission of Ordnance Survey. We decided to stay on the mainland in areas we have been before. That way, we could avoid feeling disappointed in case we wouldn't be able to do a lot. Both of these areas are lovely and beautiful in their own right, but not as unique as the islands we visited last year. Those are almost a country on their own. Therefore I had no particular preparations in reading books or websites, as I had then. Well, I cannot forget one preparation: the constant struggle against those members of the family, including myself, that wanted to take too much in the car. Some more books, enough clothes for the case of a sudden new ice age, an extra tripod, another box of toys, the Victorian floor-lamp we found in my great-aunt's basement. You know what I'm talking about, don't you? The day you pack the car, all fits in there quite nicely, but after two days with some shoppings done, books read and clothes got wet, well then the car looks as organized as your average attic. Credits to the family though - this year I can even use the car's rear mirror sometimes! The last few weeks before our holidays were quite busy and stressful. The youngest was recovering from pneumonia, the oldest had some sort of skin infection - totally harmless, but it required daily treatment. Count in numerous weddings to photograph and things to be done before we could go. For us the Summer holidays seem to be some sort of psychological deadline for a host of stupid small jobs that really cannot be delayed, or so we think. Having introduced our party in last year's account, I just have to tell you that we all grew older. The biggest change in practical terms comes from Teun, our youngest. Last year he had a maximum speed of about 1 yard per minut. Now that he can walk, that is about a yard per second! And how he loves to walk, especially away from us. His story could serve as a sequel to runaway bride! 'Runaway baby' doesn't sound bad, does it? To avoid the need of any Mountain Rescue Team, or Baywatch, to stay in the movie theme, we have him often lined to a large pin in front of our tent. Needless to say that he is quite annoyed, and not just because of all the curious faces he causes. Our first goal after setting foot in Britain is Culross, a small Royal Burgh (market town) in Fife. In October 1997 we visited this lovely old town, but at that time of year the Palace, a 16th century merchant house, was closed. So expectancies were quite high this time. This big yellow house is the most distinctive feature of Culross. But nevertheless the National Trust for Scotland in its wisdom decided to have it opened from Thursdays to Mondays only. And we happen to be there on a Wednesday, as are many more tourists. A friendly mason, working on the restauration of some gable stones, helps us and others as well as he could, with providing some information on the building. That and a visit to the gardens, which were fortunately open, rescues the day. By the way, the boys like the playground better anyway, but that comes as no surprise. The next stop is Callander, where we know to be a great second hand bookshop (see 'Every morning is different' for our first stay in Callander and here for a picture of the shop and its owners.). And indeed, I have to trim down the number books I want to buy to a mere nine pieces (remember the packed car?). For us the motto of the shop It is why you came here proves very right! As planned we arrive in Killin, the West point of beautiful Loch Tay, around dinner time. Finding a good campsite is not that easy though. 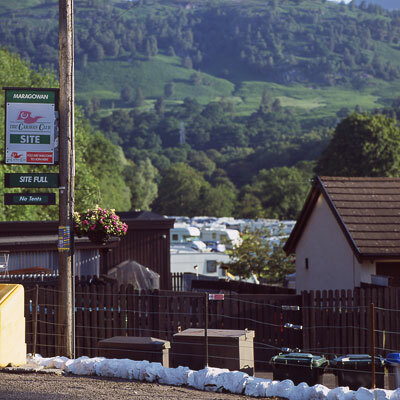 The first two are these typical Caravan Club all pavement and gravel overcrowded sites, where you don't want to be when under 50 or without a dog. The third is layed out on some high terraces looking out over the loch, a great location. But for safety reasons (the place is very steep) there are no children under 10 allowed... So further again, to Milton Morenish. A good site near a farm house with lots of grass and places to play. It is just a pity that there is no direct view to the loch. As we like the area and can use some rest, we decide to stay for three nights and explore the area around Loch Tay and Ben Lawers, before heading further North to the Cairngorms. This article is written by Wim van Velzen, © 2006.